Your dad has been there every step of the way.Â He taught you to fish, to ride a bike, and to enjoy the great outdoors. Naturally he deserves a gift fit for a king. Give him a gift heâll be proud to show offâ something heâll use for years to come. 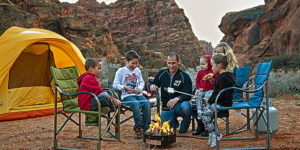 Weâve scoured the OutdoorCooking.com website to find the very best gifts for dad this Fatherâs Day. If youâre dad is a do it yourself kind of man then heâll enjoy making his own jerky. This smaller junior jerky gun will be perfect for those dads just starting out. 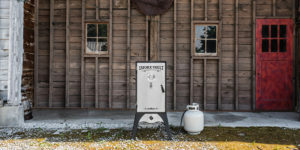 The simplistic design and 1-pound capacity jerky gun makes it easy to handle.Â Heâll be making homemade jerky, snack sticks, and sausage links in no time. We canât get enough of the convenient Sherpa Camp Table. Not only does it pack nicely, but your dad gets extra storage space with the four removable storage bags/bins. Take it to the campsite, bring it tailgating, or set it up in dad's work shopâeither way he will love the versatility. In true royal fashion the Kingâs Camo Stryker 200 is the perfect gift for the dad who loves the outdoors. This compact stove runs conveniently on both propane and isobutane fuel sources.Â Heâll haul around a mere 19.4-ounces and be able to cook up to 1.3-liters.Â If your dad loves backpacking, wants to save on space, and still eat like a kingâget the Kingâs Camo Stryker 200 Stove. The Weston food dehydrator line is a versatile gift that dad will love to add to his fleet. Easily make healthy snacks like dried fruits, banana chips, fruit-roll ups, and jerky.Â Heâll be taking these snacks on his next hunting, camping, or road trip. The light-weight counter top design allows for an easy store. Plus, clean up is essentially non-existent. 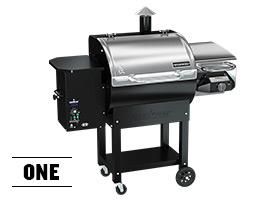 Dad will be the talk of the town with this massive flat top grill. The possibilities are endless with the flat top grill line by Camp Chef. The large 877-square inch griddle heats food evenly for a foolproof cook every time. Fire up a couple burners and feed the family or light up all six and cook for a crowd. 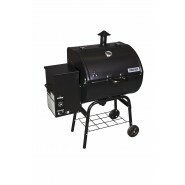 All dads want a trusty smoker for their back patio. Give dad the sleek Bronze SmokePro SG Pellet Grill. 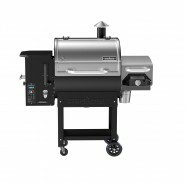 New Slide and Grill Technology allows for dad to diversify his BBQ style by cooking with either direct or indirect heat flames. The larger hopper capacity means less time topping it off with pellets and more time cooking.Â Add the BBQ Sear Box to help him extend the menu or get him a bag of his favorite pellets. This might be the tastiest gift on the list! Which product is your dad getting this Fatherâs Day? Let us know in the comment section below! To us, cooking and grilling season is year round.Â If youâre on the fence about which products toÂ buy, weâve got you covered. Gear up for the seasonÂ with our 2018Â best sellers. Our best sellers are completely customer curatedâmeaning you canât go wrong. Stock up on your fellow outdoor cooking enthusiastsâ favorite products for a yearÂ youâll never forget. 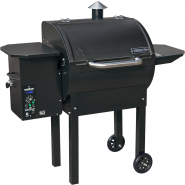 It should be no surprise that Camp Chef'sÂ Woodwind Pellet Grill that launched April 2017 is still our top seller.Â Customers love the diversity of the included side sear box. 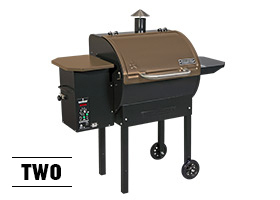 Pair these two cooking styles together makes theÂ Woodwind one of the most versatile grills on the market. The grill chamberÂ can reach temperatures between 160Â° F to 500Â° F, while the sear box can reach 900Â° Fâperfect for getting that perfect caramelized sear. 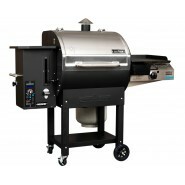 The SmokePro line by Camp Chef is a staple for pellet grill fanatics. 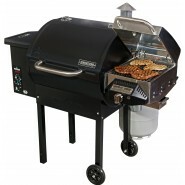 This bronze 24 inch DLX pellet grill is perfect for at home back patio grillers. Cook food to perfection with user friendly features like the dual temperature sensor and digital temperature display.Â The Smoke Pro DLX is perfect for beginners or seasoned smokers alike. 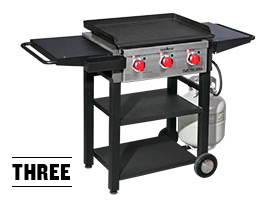 The Flat Top Grill 475 is the smallest of the Flat Top Grill fleet by Camp Chef. And boy, theyâve been selling like hot cakes this season. Speaking of hot cakes, thatâs not all they can make. Expand your menu ten foldâweâve seen everything from Sizzling Steak Fajitas, grilled vegetables, and melt in your mouth chicken parmesan sandwiches. 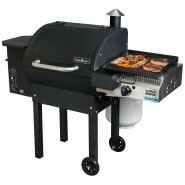 The SmokePro Lux pellet grill was made for our customers who want a larger cooking area. 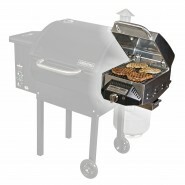 Enjoy all the features of the SmokePro line on one of Camp Chef'sÂ biggest units. Get 875 -quare inches of unrestrained savory smoking space. 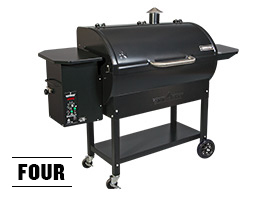 This sleek black grill is the perfect addition to your back patio. For our ever-active outdoor cooking enthusiasts, the Pro 90X is our best selling stove.Â Set up for a Friday night football tailgate part, then seamlessly transition to the campground on Saturday morning. The two folding shelves are perfect for extra prep or rest space, while the three-sided windscreen helps protect from the elements. Cook brats, burgers, and everything in between on three powerful burners.Â For even more added fun our consumers love to mix and match other 16 inch accessories like a fry griddle and pizza oven. 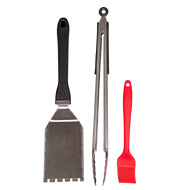 The Camp Chef BBQ Tool Set is our best selling accessory to date. 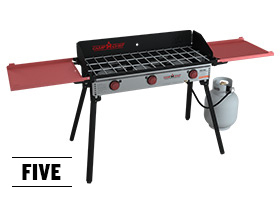 Its multi-use, three-piece set pairs well with just about every grill on the market. Get aÂ silicon basting brush, a grill box spatula, and a pair of tongsânothing but the grilling essentials. 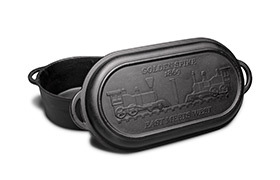 Newly launch and loved by everyone, the Dutch Oven Oval Roaster is a must-have for those who love cast iron.Â The historic scene imprinted on this limited time item pays tribute to the historic Golden Spike site in Utah. What gear/equipment couldÂ you not have lived without this year? Let us know in the comment section below! Are you new to the art of smoking? 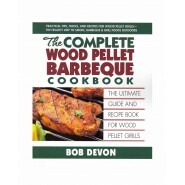 Are you ready to grow your arsenal of cooking gear and take your BBQ skills to the next level? Well, you're in luck. Reverse searing is the method used in which meat is cooked at a lower temperature for a longer period of time then finished on high heat with a sear. The advantage of this cooking style is that you get to enjoy an even cook and color on the inside with a golden-brown, seared exterior. When you reverse sear a burger, you can count on perfectly cooked meat with the classic sear you love on the outside. This method works wonders for thick 1/4-pound or 1/2-pound patties. Give it a try, and you'll never want to cook burgers any other way. 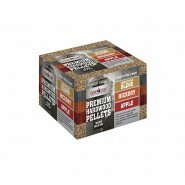 Preheat your pellet grill or smoker to 225° F.
Form ground beef into 6-8 balls. Then flatten each ball to form a patty about 1/4-inch thick. Sprinkle each patty with salt and pepper according to your preference. You can also apply other seasonings at this stage. 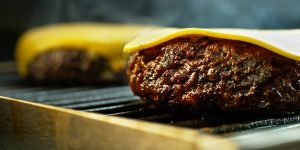 Place patties on preheated grill and smoke until their internal temperature is 10-15° under the desired finish temperature (about 115° F to finish at medium rare at 130-135° F). Turn on Sear Box and preheat to high heat while burgers are cooking. Then sear patties on each side for about 45 seconds. For really good BBQ, you need two things: time and patience. In other words, the low and slow method. Cooking some meats at a lower temperature for a longer amount of time can produce incredible flavor and texture. Weâre talking about fall-off-the-bone ribs and melt-in-your-mouth brisket. Tenderness like that comes from giving the tough connective tissue in your meat plenty of time to break down. What youâre left with can only be described as amazing. Read on for our best tips on how to cook low and slow like a true pit master. 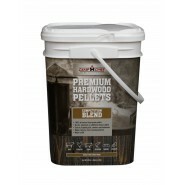 Double check that your pellet hopper has enough pellets or that your propane tank is full enough to last you through the cook. Some large cuts of meat like brisket or pork shoulder can take as long as 14 hours to cookâyou donât want to run out of fuel right in the middle of that time. You should plan to burn between Â½ lb. and 1 lb. 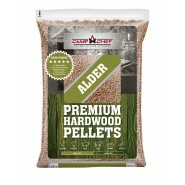 of pellets per hour of smoking on a temperature below 250Â° F (cold weather might increase pellet consumption). With an 18-pound capacity hopper on most pellet grills and a bulk propane tank for your smoke vault, you should have more than enough room for the pellets you need. Like we mentioned above, some cuts require hours and hours to cook. The meal is well worth the wait, so you want to make sure youâve given yourself plenty of time. Thereâs no rushing allowed when it comes to low-and-slow cooking. Just sit back, relax, and wait for the incredible results as a reward for your patience. If the lid is lifted on your pellet grill or the door open on your smoker, youâre letting the heat out and, therefore, stalling the cook. Itâs tempting to check on your meat, we get it. But you need to resist that temptation and keep the lid closed and insulated as well as you can. A consistent temperature is key in slow smoking. Your meat will absorb the most smoke and develop its smoke ring during the first hour or so of the cook time. You want to make the most of this period. It helps to start with a cooler piece of meat (donât bring it all the way to room temp) and spritz the meatâs surface occasionally to keep it moist. 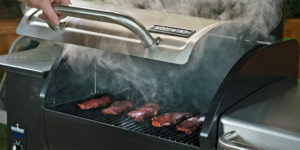 Both the colder temperature and the wet surface of the meat will attract more smoke molecules to stick to it. The color of smoke lets you know the size of its particles and how much light they absorb and reflect. Youâre aiming for blue, almost clear smoke for the majority of your cooking time. This type of smoke has the smallest particles and provides the best flavor. Black smoke, on the other hand, carries large particles and can often leave an acrid taste behind. White smoke is somewhere in between. 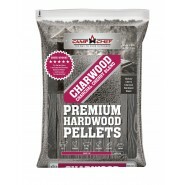 You can change the type of smoke your pellet grill is producing by opening the chimney and allowing more oxygen to reach the fire pot of your pellet grill. An oxygen-starved fire will give off black smoke; an oxygen-rich fire will give you that blue smoke you want. 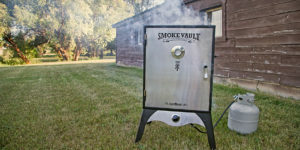 What are your favorite tips for low and slow smoking? Itâs an art form as much as it is a cooking method. Let us know your expert tricks in the comments below, then check out our collection of pellet grills to start smoking on your own back patio. 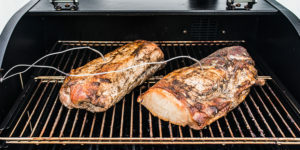 An amazingly simple recipe for great tasting pork to try this Memorial Day Weekend and any weekend.